A local independent run business based in Caterham, we cover nearby villages and other towns too. 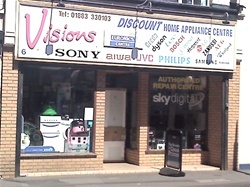 We stock a wide range of domestic electical goods, TV's, Satellite, digital, audio and accessories. Our service department provides repairs and advice too. We provide Sony, Phillips, JVC, Samsung, LG, Toshiba TV and audio equipment and our domestic range covers Dreda, Dyson, Lec, Bosch, Indesit, Zanussi, AEG and Whirlpool. We will instal new equipment supplied by ourselves and dispose of old equipment, if you are a Shop Smart card holder, together with free delivery. Our prices are competitive too, being part of the Euronics buying group.